I'M A FARMER, I'M 31 YEARS OLD AND HAVE BASICALLY BEEN FARMING MY ENTIRE LIFE. FINANCIALLY, FARMING HAS BEEN TOUGH THE LAST FEW YEARS. THROUGH INEXPERIENCED MISTAKES I HAD GOTTEN MYSELF INTO SOME FINANCIAL TROUBLE. POOR PRICES HAVE MADE THE MARGIN FOR ERROR VERY THIN. LAST DECEMBER I WAS ASKED TO DO SOME TRUCKING WITH MY HOPPER. I KEPT SOMEWHAT BUSY. 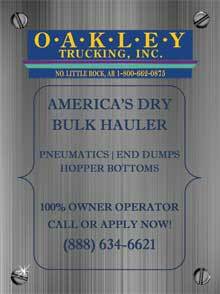 I JOINED BULK LOADS AND HAVE MADE SOME EXCELLENT CONTACTS WITH SOME GREAT COMPANIES. WE HAD A SUCCESSFUL YEAR. IT HAS GIVEN ME THE OPPORTUNITY TO PAY DOWN FARM DEBT, SUPPORT MY FAMILY, AND FLEXIBILITY TO HAVE TIME WITH MY FAMILY. NONE OF THAT WOULD HAVE BEEN POSSIBLE WITHOUT THE CONTACTS I MADE WITH BULK LOADS. THANK YOU SO MUCH AND HAVE A MERRY CHRISTMAS!!! I can't believe how I took your advice and started to network with others on this site. I can't believe how many freaking opportunities have opened up for us! - Dale W.
CLICK HERE TO OPEN UP MORE OPPORTUNITIES FOR YOUR BUSINESS NOW! Try our LOAD HISTORY feature which gives you a breakdown of all historical load posters by state to contact. Click here to go to LOAD HISTORY.